Just a reminder that on Tuesday April 9, we will be meeting in Van Pelt Library, Room 124. We will be having lab time in which you will work on your digital video and map for your final project. Participating in the lab counts toward your participation grade, plus it is a chance to work on your project during regularly scheduled class time. Mac laptops will be provided for those who don’t bring their own, but if you use the provided computers you will need to bring your own drive to download your project files to take home (make sure the drive you bring is big enough to hold multiple video files, which can be very large). This entry was posted in Admin and tagged admin on April 5, 2013 by channabach. I want to let you know that my Office Hours next week (Monday April 1 and Tuesday April 2) are canceled. I am happy to set up alternative times to meet with you next week on GChat or Skype, or in person in my office, if you want to discuss your final projects or anything else regarding the class. Hope you all have great weekend! This entry was posted in Admin and tagged admin on March 30, 2013 by channabach. 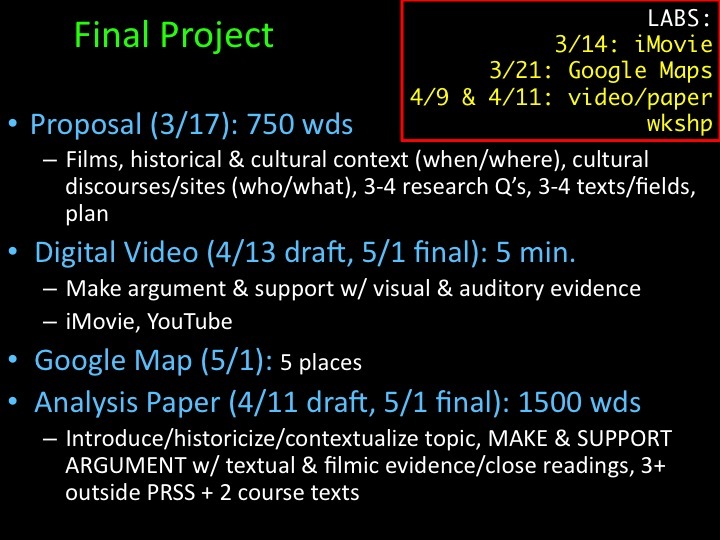 Just a reminder that your Final Project Proposal is due this Sunday March 17 at 11 pm. You’ll post your proposal to the course blog the same way you’ve posted your other assignments. Make sure it contains the required elements, and gives me a sense of what you want to do your project on. By Tuesday March 19, make sure you’ve read and commented on at least one of your classmates’s proposals: let them know what you think, ask them questions or answer any they pose, offer suggestions of texts or ideas for their digital videos, etc. This entry was posted in Admin and tagged admin on March 15, 2013 by channabach. Hello everyone. Just a reminder that we will be meeting for our class tonight at 10:30 am in Van Pelt Library, room 124. We will have a presentation on how to use iMovie for your final projects, and some time to play with the software and figure out how to use it. This entry was posted in Admin and tagged admin on March 14, 2013 by channabach. This entry was posted in Admin and tagged admin on February 28, 2013 by channabach. FYI: My Office Hours for Tuesday February 19 are canceled. You can email me to discuss anything & we can set up an alternative time to meet if you want. This entry was posted in Admin and tagged admin on February 19, 2013 by channabach. As you know, on Tuesday January 29 (tomorrow), we will be watching the film Chocolate Babies in class. And as with all film screenings, we will also be taking notes during it. However, we are going to be taking notes in three ways. 1) Twitter notes: For this option, you will live tweet during the film screening, using our course hashtag #queerfemfilm. You’ll need to bring a laptop, tablet, or smartphone to do this. You’ll tweet your notes on the film, which will show up in our course feed. 2) Collaborative Google Doc notes: For this option, you’ll type your notes into a collaborative Google Doc found here. Everyone who chooses this option will be typing in the same document, and you’ll be able to see what other people are contributing it in real time. You’ll need to bring a laptop or tablet to do this. 3) Non-collaborative notes: For this option, you will hand write or type your notes into a document or notebook of your choosing. You are the only person who will be able to see these notes during class (we’ll share them later) as you’ll be creating them individually. You’ll need to bring a laptop, tablet, or notebook/pens/pencils to do this. You’ll need to choose one of these three options BEFORE class tomorrow, and come ready to start at the beginning of class. The film runs 80 minutes so we will start screening right at 10:30 am. Participation in this activity is considered class contribution, so make sure you contribute in one of the above three ways. The goal behind this notetaking activity is first of all to encourage everyone to take notes on the films for this class (something you should be doing anyway), and second of all to explore the ways collaboration and different platforms can be useful (or not) in notetaking and critical thinking in film studies. If you have any questions about this activity or these options, let me know. See you tomorrow for our screening of Chocolate Babies! This entry was posted in Admin and tagged admin, class activity, notes on January 28, 2013 by channabach.